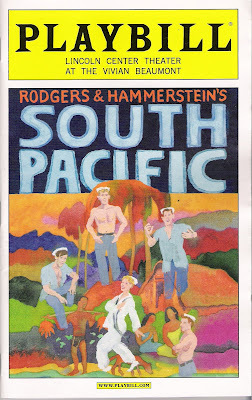 So last Oct. 2, 2008 I saw South Pacific with Mike and Tom at the Vivian Beaumont Theatre of Lincoln Center. It's the second production of the show that I had seen (the first one was from Repertory Philippines with a very young Lea Salonga as Liat). It is a very exquisite production of the show. The music is so beautiful specially when you hear it with the original orchestrations and that 30 piece orchestra! In fact the most thrilling part for me during the night was when *** spoilers *** the overture played and the thrust stage was retracted revealing the orchestra. The audience that night exploded with applause at that moment (I have heard though that, that happens every night). It is so refreshing to hear that full rich music in that theatre. The show is perfectly casted Kelli O'Hara is wonderful as Nellie Forbush with her crystal clear soprano while Paulo Szot is commanding as Emile De Becque. Loretta Ables Sayre (Bloody Mary) and Danny Burstein (Luther Billis) were both funny and good in their roles. Even the ensemble of guys and gals were excellent. Our Lt. Cable that night was Andrew Samonsky who had the privilege of singing my favorite song in the show.....Younger Than Springtime. He has a very beautiful voice that will make you fall in love ha ha ha! I should say though that we were sitting on the last row of the balcony and the actors didn't seem to be mic'd (which was nice to hear a more natural sound) but I could still hear every note of a song and every word of the dialogue......just unbelievable! The set is amazing! Now I know why it won the Tony for set design beating Sunday In The Park with George. The set really does transport you to an island.....with a beach, an army camp, army trucks and an airplane....it could very well give the helicopter from Miss Saigon a run for it's money. If you get a chance don't pass this up. It's amazing to see one of the classic pieces of musical theatre done very well.